Contact us to arrange a booking. Generally offered on Friday afternoons. Do you need some one-to-one teaching/mentoring or would you and your friends like to have a class together? Our private classes are ideal for practising ceramic artists to trouble-shoot techniques or update their practice. They can also be used by private groups for a fun activity where you can learn something new. 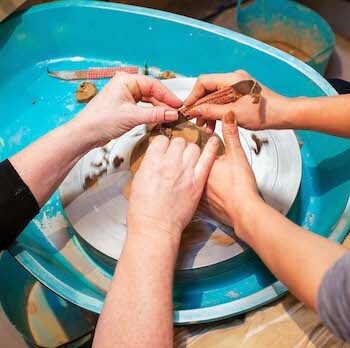 Come to Slow Clay Centre to experience ceramics either on the potter’s wheel or hand building. Join award-winning ceramic artists and experienced teachers who will guide you at whatever level you are at. As a social activity, you can create objects from a humble lump of clay turning them into somethnig special that you will be able to collect after firing a few weeks later. For mentoring and higher levels, your individual problems can be solved! Teachers will demonstrate all techniques and provide as much assistance as needed. Participants usually produce a group of small items or one or two larger ones. Available on Friday afternoons. Bookings in advance are necessary. Participants are welcome to bring their own refreshments or we can arrange catering for an extra fee. Note: Individuals who wish to join a single session group class are advised to enrol in a Taste The Clay class. These are usually held weekly on Friday evenings. Ongoing mentoring is available by request with any of our teachers.